This crooked pirate captain knows the seas like the back of his hands. You can surely trust this ol' captain. 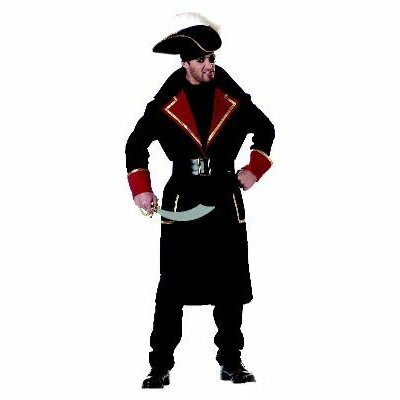 Our authentic looking Capt'n Scurvy adult costume features a detailed flocked crushed velvet coat with gold trim, foam pirate hat with feather, bandana and belt. A great Halloween costume! Pirate sword, pants, eye-patch and shoes NOT included. Small (38-40): Chest - 38" Waist - 32" Hip - N/A Height - 70"
Medium (40-42): Chest - 42" Waist - 36" Hip - N/A Height - 70"
Large (42-44): Chest - 44" Waist - 38" Hip - N/A Height - 70"
X-Large (44-46): Chest - 46" Waist - 40" Hip - N/A Height - 70"
Plus 2X-Large (48-52): Chest - 52" Waist - 48"
Hip - N/A Height - 70"
Small/Medium (38-42): Chest - 38" to 42" Waist - 32" to 36" Hip - N/A Height - 70"
Large/X-Large (42-46): Chest - 44" to 46" Waist - 38" to 40" Hip - N/A Height - 70"